War threatened to pull them apart. Hope bound them together. Nothing has been the same for Samuel and Julia Wortham since the attack on Pearl Harbor in 1941. All around them young men are enlisting for the service, leaving the safety of the rural community that has sheltered the Wortham family since the Great Depression. Now their own beloved son Robert has gone to fight for his country, along with three of the Hammond boys. Julia's heart aches for the boys while Robert's girlfriend, Rachel Gray, offers a prayer that changes the lives of all who hear it. Those left behind struggle to find their place and God's plan amidst the chaos of war. As the letters from Robert and the Hammond boys slow to a stop, can those at home find God's peace? About "Rachel's Prayer (#02 in Country Road Chronicles Series)"
The Wortham family has been tested through hard times of injury, illness, and loss. But with the world on the brink of war, they are about to be tested again. And this time, they'll face the ultimate test: one of courage and survival. Just days after the surprise attack on Pearl Harbor, Robert Wortham and Willy Hammond enlist. As they head off to fight, their families are left behind to deal with fears of what lies ahead for their beloved brothers and sons. Armed with their faith in God and a bold prayer from Robert's girlfriend, Rachel, the Worthams and Hammonds can only hope for peace, strength, and a greater understanding of God amidst this cruel conflict that could forever change the future of both families. 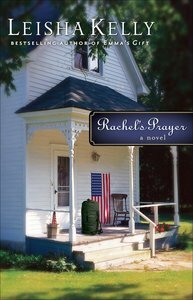 The continuing story of the Wortham family and book 2 in the Country Road Chronicles, Rachel's Prayer is a powerful saga of courage and faith during the Second World War.